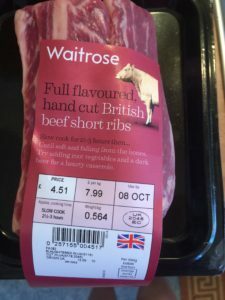 Recently I was in East Cowes, and seeing they had a Waitrose store there, I just had to have a look around. 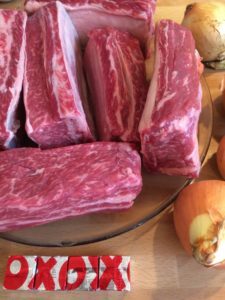 You know how it is, I didn’t need or want anything but I saw these beef short ribs, and I had to have them. This is a cut of meat I had wanted to try for some time. These are not usually available in most of the places that I shop. 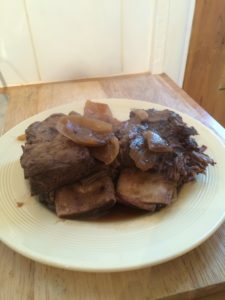 So I bought the beef ribs and made the following recipe. The end result was delicious, beefy and fall off the bone delicious. I made these on my stove top as my oven is out of action (I spilt melted cheese into the workings!!!). If you have a working oven then these could easily be cooked in there instead, on a low setting. 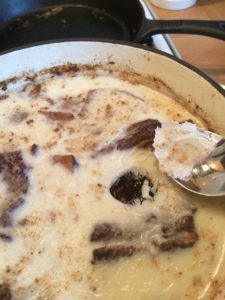 Heat up a frying pan, then add the beef dripping. 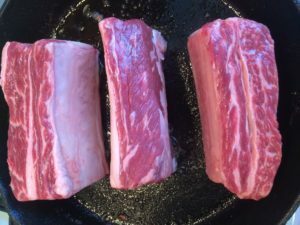 Once the pan is up to frying heat add the beef short ribs and brown the meat on all sides. Do 2 or 3 ribs at a time to maintain the heat in the pan. Place the seared ribs in a cooking pot (I used an enamel cast iron pot). 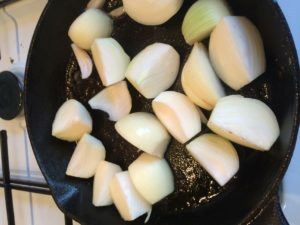 Once the ribs have been seared brown off the onions, once cooked add these to the pot. Make up some beef stock by crumbling the oxo cubes into a litre of water. Use a small amount of the stock to de-glaze the frying pan. To deglaze a pan keep the heat going under the pan. Add about 1/4″ of stock to the pan as it bubbles up use as wooden spoon to mix in the brown pieces of food that have stuck to the bottom of the pan. Deglazing adds flavour to the recipe. Note: if you have some homemade bone broth or well flavoured stock use this instead of the OXO cubes. 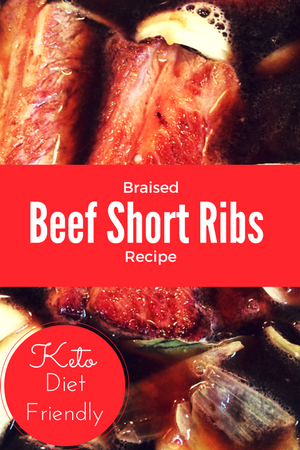 Pour this liquid over the ribs and top up with the rest of the stock. If necessary add some water until the ingredients are just covered. Add the dried bay leaves. You could now put these into a low oven (about 150C) for about 3 1/2 hours. If using a stove then put on low for 3 1/2 hours. You know when these are cooked when the meat is falling off the bones. As with all meat braised recipes, it is best to cool the ribs down and store in the fridge and reheat the following day. This has the advantage of allowing the fat to solidify so it is easier to remove the fat. As you can see from this photograph there quite a bit of fat on top, don’t worry about this just remove this with a spoon. If you want to eat these straight away then, fish out the bay leaves and use a spoon to remove the layer of fat floating on top of the ribs. Taste the gravy and add salt if you feel you need it. I found the oxo cubes were salty enough. I just ate the beef ribs on their own with a spoon…delicious, very beefy, and melt in the mouth. These would be nice with some mashed swede and cabbage. All the bones were stashed in the freezer with my leftover bones collection to make bone broth in the future. Nothing gets wasted in this house! How Much Did the Meat Cost to Make This Dish?